Since I decided to turn vegetarian, my travels have become more challenging yet exciting, and my Burma adventure is not an exception. I had no clue what Myanmar food looks like and tastes like before going, yet been event told that it would be pricey to have vegetarian meals there. However, Myanmar turns out not a country that relies heavily on meat-based diet and travelling through this country a genuine delight. As a Southeast Asian country, Burmese cuisine uses a lot of fresh veggies, herbs and fruit. Furthermore, owning to the geographic location of Myanmar, Burmese cuisine has been influenced by Chinese, Indian and Thai cuisines. It means there are vegetarian-friendly dishes galore to go for from street food stalls to restaurants and they are all affordable. So I could say I indulged myself with eating vegetarian food during my 8-day trip roaming three cities Yangon, Bagan and Mandalay. First of all, what FOOD does this lovely country offer? 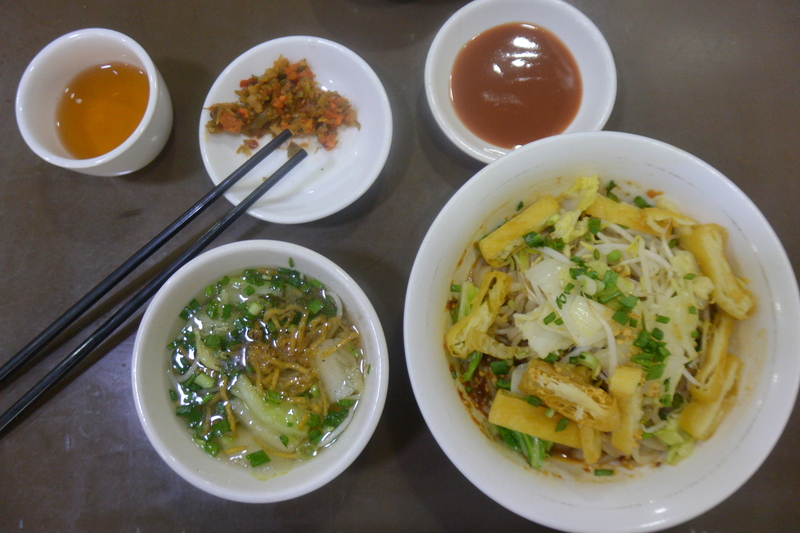 Mind you, Shan noodle is one of the most popularly seen dishes that can be served in vegetarian/vegan version in Myanmar. There is also a dish called tofu shan soup which is made from chickpea tofu, smashed nuts sesame seeds, parsley, cabbage, and a huge dose of ground, crunchy chili paste. Sadly, I didn’t go for this one. If you crave something fresh, go for salads. 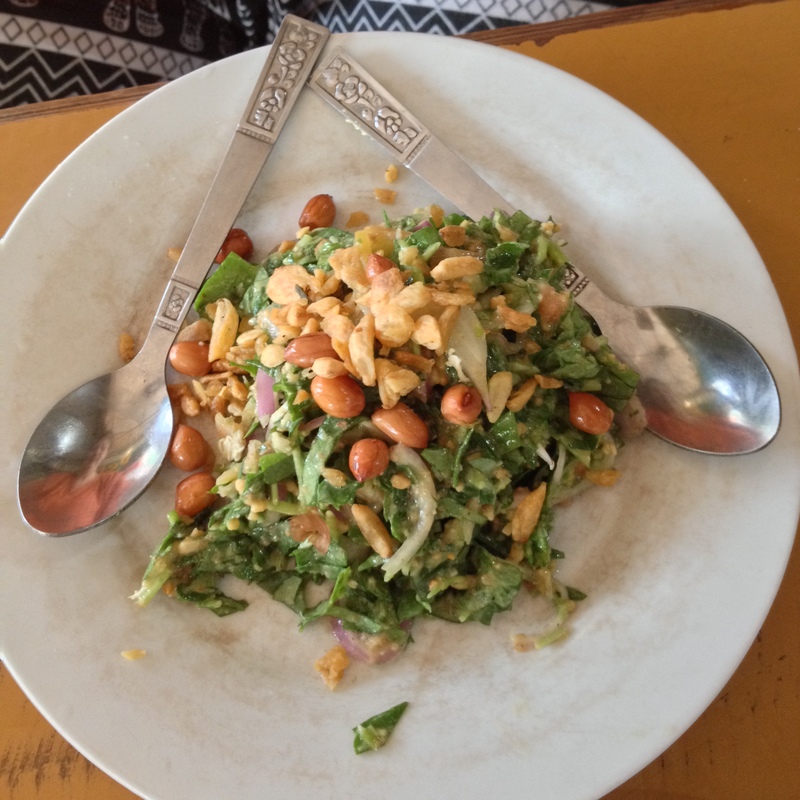 Burmese cuisine includes a variety of salads, centred on one major ingredient, ranging from starches like rice, wheat and rice noodles, to vegetable and fruits such as tomatoes, papaya and green tea. The tea leave salad is the most must-try one since it’s unique and spectacular. The base of the dish is fermented tea leaves which give the dish a strong and unfamiliar flavour at first. But it is balanced out by other added ingredients such as peanuts, sesames, tomatoes and herbs. Tofu salad with silky chickpea tofu, nuts, herb and dressing is also a dish worth trying. Love fusion cuisine? No worries. Burma is blessed with a huge range of cultural influences based on its history and location. There are heaps of Chinese-influenced dishes to go for like stir fried noodles, noodle soups or vegetable cooked in different ways. For Indian food lovers, it is not difficult to find Indian restaurants in cities or at any street stalls in Myanmar. 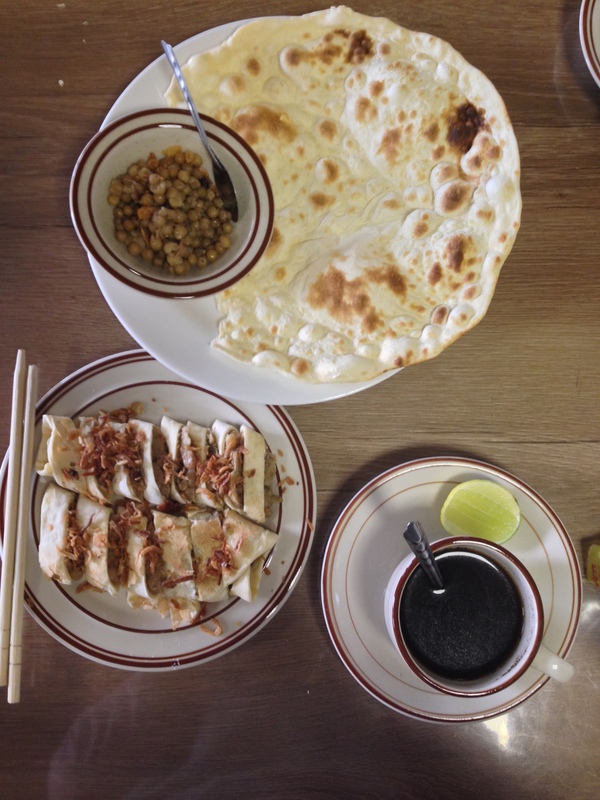 There are some Burmese versions of Indian flat bread that serve a good breakfast. Want something sweet? 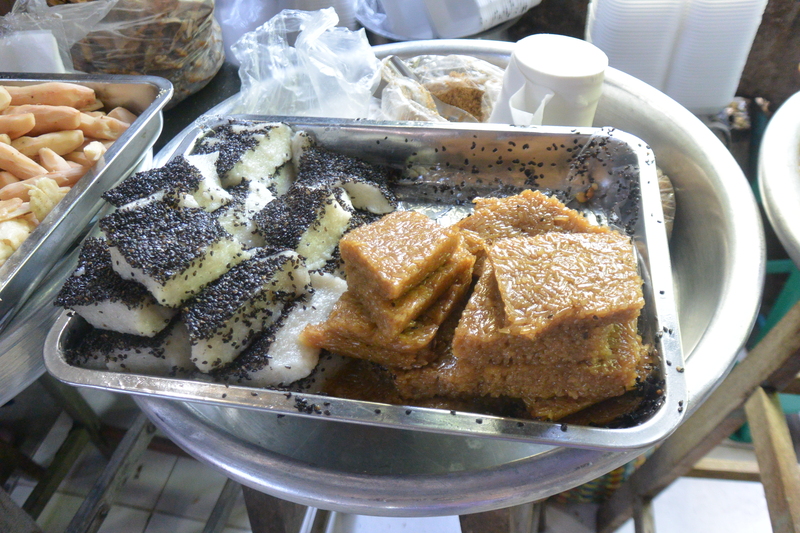 Pick some dessert made from sticky rice, coconut milk and palm sugar at any market or street stand you pass by. One more thing, the word for “vegetarian” in Burmese sounds like “ta-ta-lo”. If you are not confident with your pronunciation, you can ask a local to write the word down in Burmese and show the paper to restaurant people when you order food. 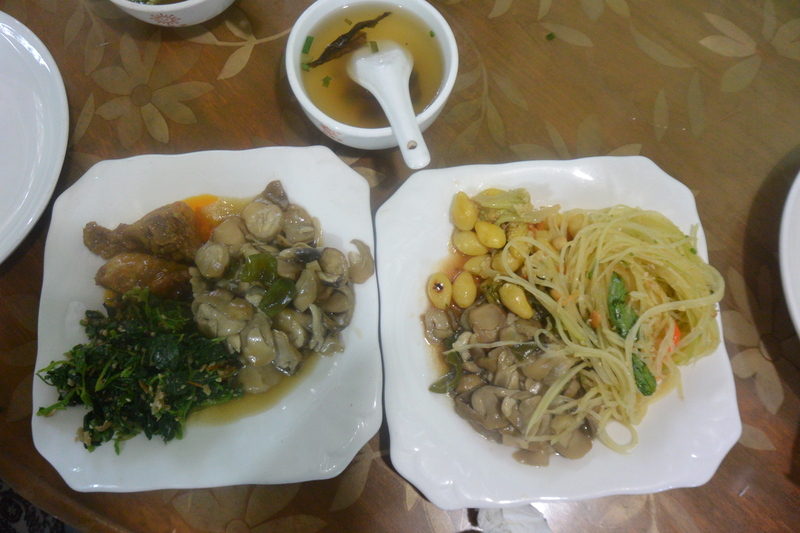 Besides, vegetarian food in Myanmar may consist of non-veg ingredients like fish sauce, shrimps, dairy, eggs, etc. So make sure that you let the restaurant staff know what you can have and what you cannot to avoid wrong food. 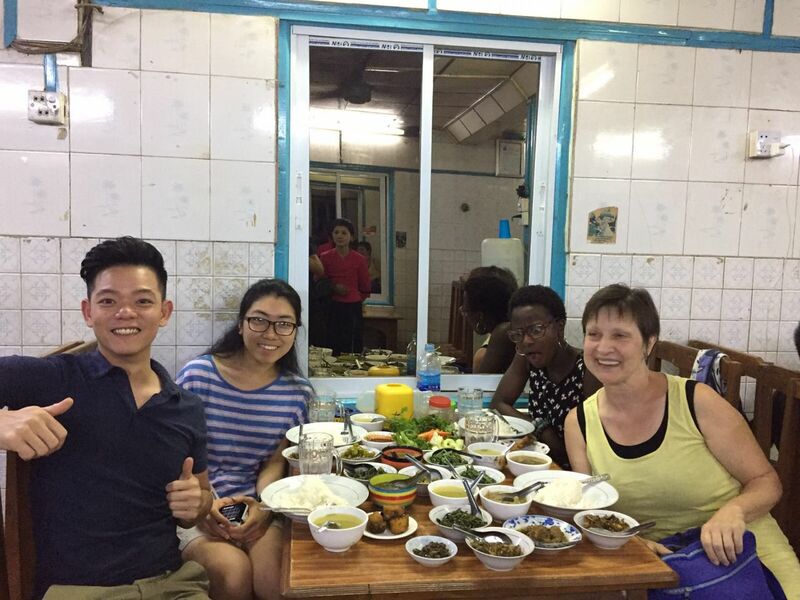 Now, it’s time to discover PLACES FOR VEGETARIANS/VEGANS in Myanmar. This is the first Burmese local eatery I visited in Myanmar, thanks to my couchsurfing host who brought me here for breakfast. 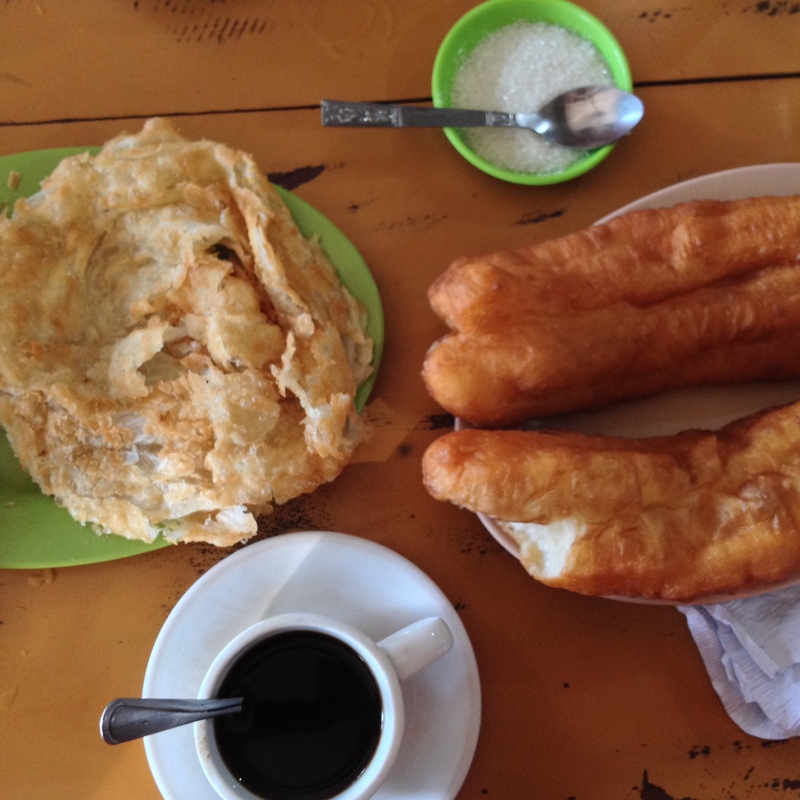 I ordered Burma rotti and Pe Byouk, one of popular morning snacks in the country. The rotti is a form of Burmese Indian style naan and Pe Byouk is boiled beans. It can be served in wrapped version (like burrito) or non-wrapped but I requested the burrito one with fried shallots on top as it looked more appetizing to me. I absolutely loved the dish and the restaurant as well. It opens all day, serving up various Burmese traditional meals so people can get by any time throughout the day for breakfast, lunch or dinner. It is the first name appearing on the search page when I googled “Shan noodle”. Apparently, it is one of the most well-known food shops in Yangon. The shop serves both veg and non-veg dishes. 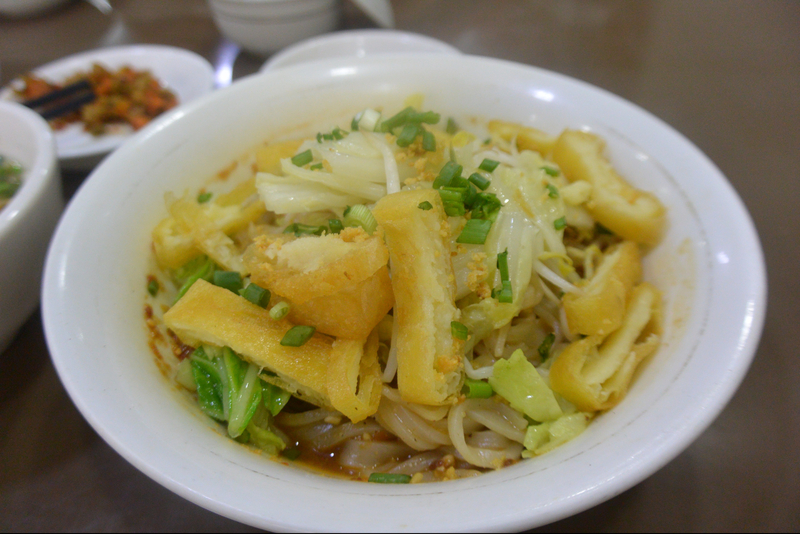 Some of their outstanding veg dishes are Shan noodle, fried tofu, Shan tofu soup and fried vegetables. We visited this place twice and were happy with what we got. The food was tasty with reasonable price, the place was clean and staff was welcoming. That’s reason why it has got numerous positive -backs on travel websites and been recommended by Lonely Planet. 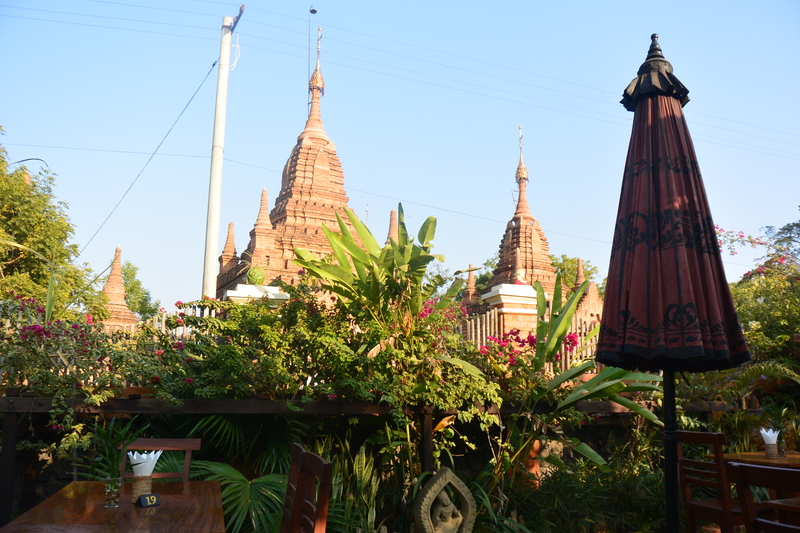 I could name Bagan the “vegetarian town” of Myanmar due to a number of vegetarian/vegan restaurants here. However, besides those places, it is not difficult at all to find meat-free options in this town since most of restaurants here serve veggie dishes. Not until my travel mate told me did I know this lovely eatery is just a stone’s throw away from our hostel. If you love simple and fresh dishes of rice, veggies and fruits, this place is for you. The thing I like most about this restaurant is that there are a plethora of mouthwatering salads with most of ingredients being raw (except rice salad) such as green tea, ginger, tomatoes and even pennywort (which is called “rau má” in Vietnamese). I tried tofu salad, which was very yummy, while the other went for rice salad, potato salad and soup. The price ranges from 500 kyat to 1000 kyat/dish (about 30 – 65 US cents), which is not costly at all. The only downside of this place is the watery and bland juice. Well, it seems anyone who have visited Bagan recommend this place. 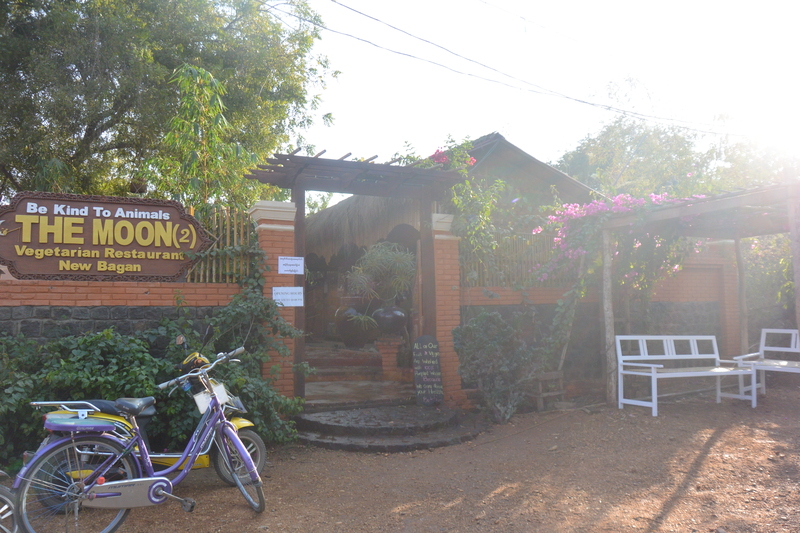 There are two locations – one in Old Bagan and another one in New Bagan. 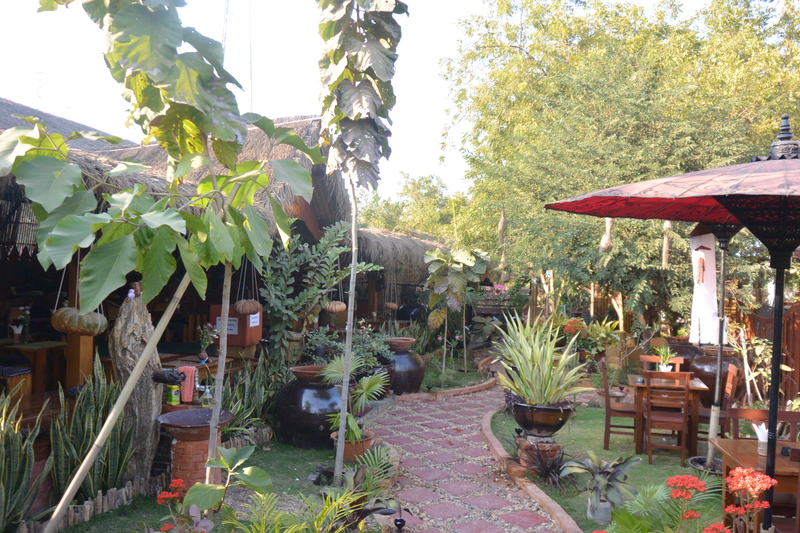 We hit up the one in New Bagan and were genuinely impressed, especially by the design. It actually looks like a garden café with a small pond, a path and lots of green, which offers a tranquil and natural atmosphere. In addition, the surrounding temples give an ideal Bagan-style background for photo shoots. In terms of food, it serves fusion dishes with pancakes, ice-cream, burgers or curry. We ordered drinks and pancakes for snacks since we craved for something sweet. This restaurant has a wide range of food, ranging from Myanmar to Chinese and Western dishes. 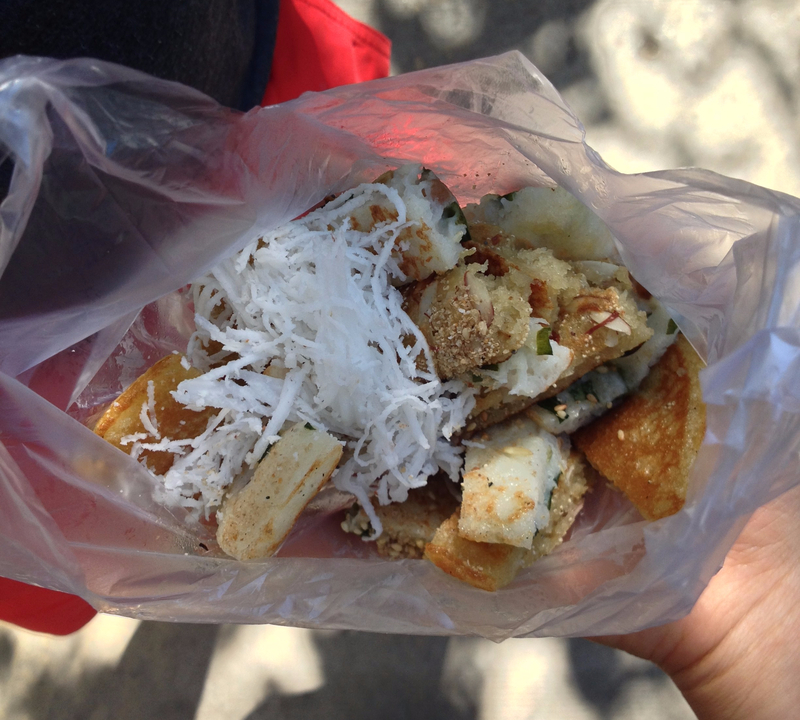 There are abundant options for vegetarians such as noodle soup, fried noodle, pancakes, salad and so on. We came here twice, one for dinner and another time for breakfast. I don’t really remember what I had for dinner since my trip was one year ago but for breakfast I had coffee, Burmese paratha and Chinese sweet dough, which is the greasiest meal I had in Myanmar. The food tasted good in general. The staff was nice but the service was rather slow, so the food already got cold when they were brought to our table. Big thanks to our hostel owner who introduced us this restaurant. The family-owned business offers a traditional Burmese family dining style with an array of local dishes including vegetarian options such as cucumber pickles, fried morning glory, fresh vegetable and herbs. 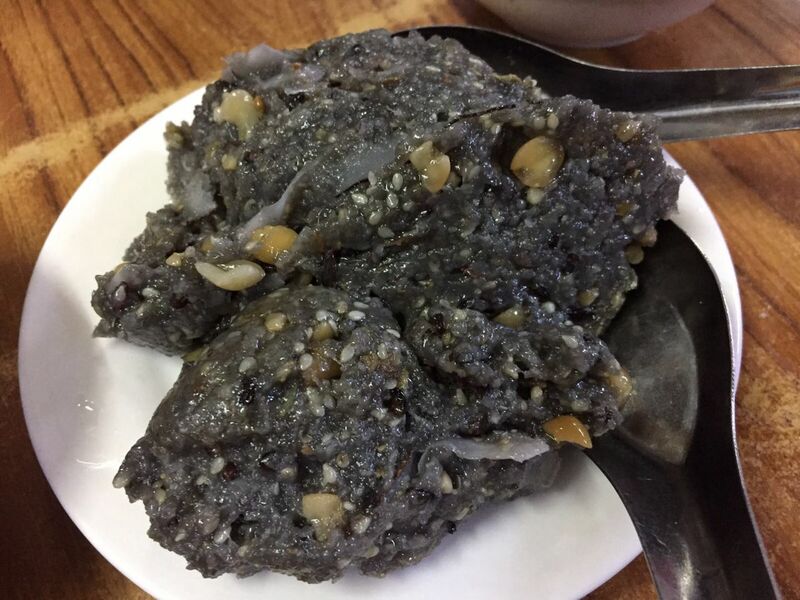 A dessert made from sticky rice, sesame and palm sugar was also included. Our jaw literally dropped when the waitress brought the tray of ordered dishes out and we just couldn’t believe the amount of food we had ordered. It was not a dinner, but a feast. And guest the price? It cost 2500-3000 kyat/person. The less you order, the less money you pay. The restaurant was clean and the staff was welcoming. Undoubtedly, this place has won my heart and I def go back to it if I visit Mandalay again next time. 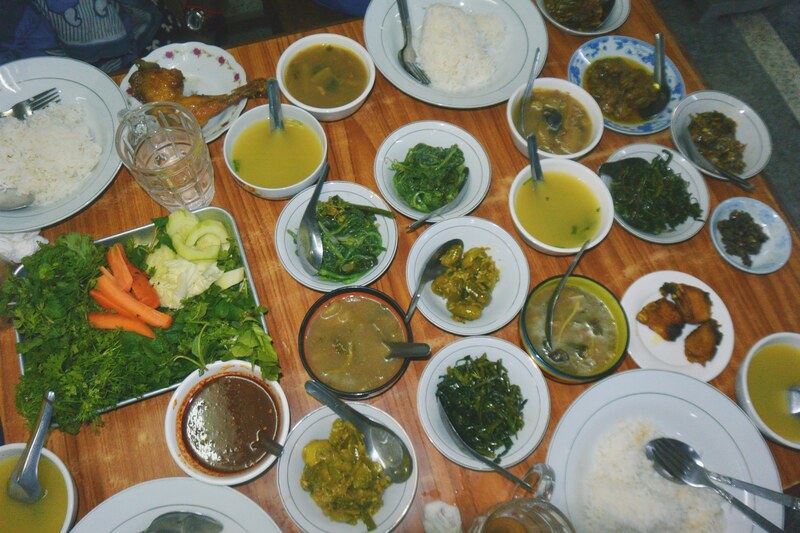 It is also one typical Myanmar food shop in Mandalay that serves vegetarian options. Non-meat eaters can go for papaya salad, stir-fried mushroom, beans and vegetable cooked in different ways. They were already cooked and display in big bowls. Dinners just come, choose the food and pay depending on the amount of food they get. Those who don’t like already cooked food can order hot meals from menu. Thumbs up for its good varieties of Asian food, quite central location. But the price is a bit higher to an open-air street eatery, which is its downside. For more posts, feel free to visit my blog . Much appriciapted!